Campus police are searching for a man suspected of peeping this past weekend into the women’s restroom at UCSB’s Davidson Library. Between 7-8 p.m. Saturday night, a woman told UCPD, a suspect stuck his cell phone beneath the door of her bathroom stall on the library’s seventh floor. UCSB police ask the community's help locating this man suspected of peeping in a women's bathroom. 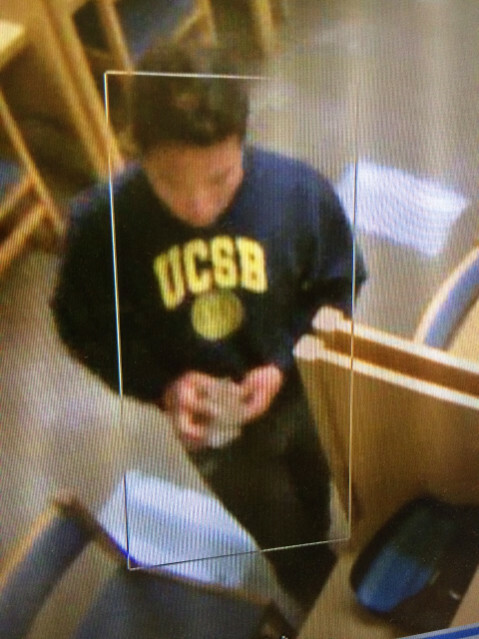 The suspect — described as an Asian male standing 5’8”, wearing jeans, a yellow-lettered blue UCSB crewneck sweatshirt, a black backpack, and carrying a longboard — was captured on the library’s security camera footage. As UCPD Sgt. Rob Romero said, the suspect went into the women’s bathroom twice: He walked out but re-entered when a woman stepped into the restroom, “possibly” to take pictures of her. Last seen heading toward Isla Vista, the suspect’s identity has not been released by UCPD. Those with information on the case are encouraged to call Detective Ryan Hashimoto at (805) 893-4558, email him at ryan.hashimoto@police.ucsb.edu, or make an anonymous report via UCPD’s webpage.